The Shining pearl of the Mediterranean, and the beacon radiating its deep-rooted culture and heritage to the world at large. The second largest city and the main port of Egypt, Alexandria was built by the Greek architect Dinocrates (332 - 331 B.C.) on the site of an old fishing village called Rhakotis, at the orders of Alexander the Great. The city , immortalizing Alexander’s name, flourished, beyond all expectations, into a prominent cultural, intellectual and economic metropolis, the remains of which are still evident to this day. It was the renowned capital of the Ptolemies, with numerous and diverse monuments. It was the scene of the most thrilling drama involving Cleopatra, Julius Ceaser, Marc Anthony and Octavius. 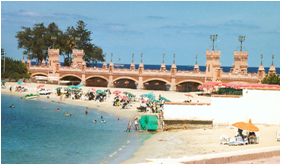 Alexandria lies north-west of the Nile Delta and adjoins Lake Mariut. It is linked to Cairo by the Delta Road (231 km.) and the desert Road (225 km). It is one of the most notable summer resorts in the middle East, for, in addition to its temperate winters, its beaches, with soft sands and magnificent scenery, stretch for 40 km. Along the Mediterranean Sea, from Abu Kir, in the east, to Sidi Abdul Rahman, in the west. Houses many collections of rare Greek and Roman relics and coins - about 40 thousand pieces, from the 3rd century B.C. to the 7th century A.D. the most important being the Tanafra statues. So named in the Middle Ages, it is a granite pillar, over 25 meters high, and built amidt the ruins of the Serapium, in 297 A.D. in honour of Emperor Diocletian. Built on the northern tip of the Eastern Port, and on the site of the ancient Pharos of Alexandria, the fort has three levels similar to medieval fortresses. 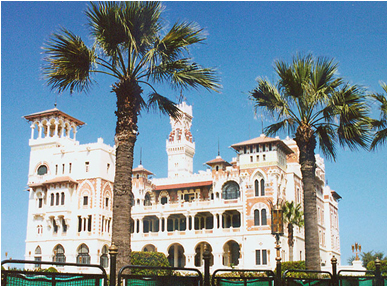 It also houses the naval museum to revive Alexandria’s old naval heritage. Situated in Al-Anfushi, this Andalusian - style mosque is the largest in the city. It has four domes and a very tall minaret. 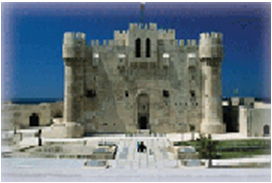 Originally the Palace of Fatma al-Zahraa, in Zizinia, it is an architectural masterpiece. Its many rooms and halls contain many rare paintings, statues and decorations, as well as a priceless collection of Jewels of the Mohamed Ali dynasty.